Johnny Cash fans will be able to hear some new, never-before-released music from the star on an album due out next year. Their son John Carter Cash said: "They never threw anything away. They kept everything in their lives. They had an archive that had everything in it from the original audio tapes from The Johnny Cash Show to random things like a camel saddle, a gift from the prince of Saudi Arabia." He added: "We were so excited when we discovered this. We were like, my goodness this is a beautiful record that nobody has ever heard. Johnny Cash is in the very prime of his voice for his lifetime. He's pitch perfect. It's seldom where there's more than one vocal take. They're a live take and they're perfect." John and archivists at Legacy Recordings didn't find the material until last year, long after the family began issuing archival music by Cash, and plan to release Out Among the Stars on March 25. Columbia paired Johnny with Billy, a producer and Country Music Hall Of Fame member who was then the president of CBS Records Nashville at a time when Cash was at a low ebb in his popularity. The music on "Out Among the Stars" is taken from 1981 and 1984 sessions. John said: "Dad was always uniquely himself and later on the world would come back around. He never modified himself. But Nashville at the time was in a completely different place. It was the Urban Cowboy phase. It was pop country, and dad was not that. I think him working with Billy was sort of an effort by the record company to put him more in the circle of Music Row and see what could happen at the heart of that machine." 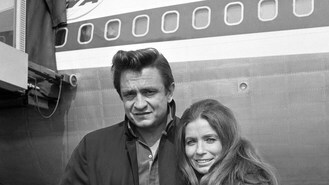 The album's 12 tracks include a duet with Waylon Jennings and two with June Carter Cash. Lily Allen has criticised Grammy bosses for leaving Lorde out of the best new artist field. Kanye West has revealed his next album will only feature eight tracks. Britney Spears has revealed that she would like to collaborate with Lady Gaga. Victoria Beckham has said she knew that the Spice Girls had reached their end five years ago. McBusted, the group formed by members of Busted and McFly, have announced a "ridiculous" new gig - headlining Hyde Park. Lady Gaga was the toast of the night as she brought the 2013 Capital FM Jingle Bell Ball to a spectacular close. Neil Young is to be among the headliners for next year's British Summer Time festival in London's Hyde Park. Lily Allen has returned to the top of the singles chart - a position she was in just two weeks ago.